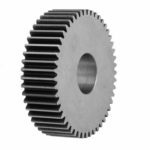 A spur gear or cylindrical gear is a simple wheel with a cylindrical contour and cut teeth on its circumference. A spur gear and mating gear (also a spur gear or a shaft with radially projecting straight cut teeth) can be meshed together if they are fitted to parallel shafts to form a cylindrical gearing. There are external and internal gears.